Writer-director, Lorene Scafaria has put together a dramedy (drama plus comedy) with which both young and old will identify. 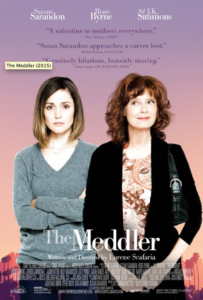 In a post-screening discussion with Ms. Scafaria, we learned that the story is a very close, realistic depiction of the writer’s own mother, who moved out to Los Angeles from the east coast after her husband died. The mother, Marnie (Susan Sarandon) who is on the screen for almost the entire film meddles or tries meddle in just about every aspect of her single daughter’s life, as well as in the lives of just about everyone else who she meets. Lori, the daughter (Rose Byrne) not surprisingly is a budding film maker, who as much as she tries, can’t get away from her mother’s love and over-attention, which of course she really needs. On one hand, we keep thinking that this mother character is exaggerated and way over the top. However, why then did she captivate our attention? The answer is that the film has captured the universal need and wish of most mothers to do just about everything and anything for their children at any age. The dialogue and Sarandon’s characterization is near perfect. The screenwriter, who of course is really the daughter telling the story of her mom, has also added a romantic twist, which she acknowledges is her fantasy wish for her mother. This brings in a potential boyfriend for her mother in the person of a dashing, handsome, senior guy who rides a Harley Davidson motorcycle and raises chickens as pets. Unbelievable you say – just wait until you see Oscar winner J.K. Simmons take on this role. This independent low-budget film has a lot going for it with a great script, two outstanding stars, a fine supporting cast and great execution by this young woman director. It also should have special appeal here in Los Angeles, where most of the film takes place from the scenes at the Grove, to glimpses of the entertainment industry in action and the beautiful west coast shoreline, as well as many characters who will remind you of people that you know.